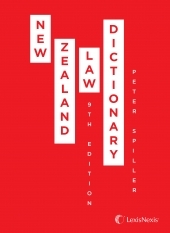 "The ninth edition of the New Zealand Law Dictionary has been revised to include an expanded list of legal terms. As a result, this new edition contains over 5,000 entries. Experienced editor Judge Peter Spiller again brings his expertise to the title, building on the exemplary s... read full description below.